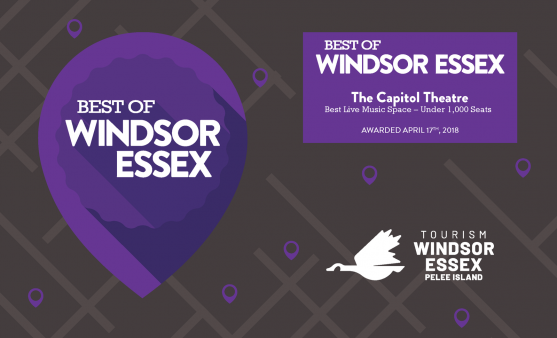 The WSO invites Windsor Essex (W-E) County Residents to Take Centre Stage! the Windsor Symphony Orchestra invites you to audition. The competition is open to all kinds of talent… aspiring musicians…dancers…actors…acrobats, magicians…or something else we may never have seen! WHY ARE WE HOLDING A TALENT CONTEST? We know there are many, many talented people here in Windsor and Essex County. We want to give them a chance to shine. On September 27 and 29, 2019, ten of the most talented amateur performers across Windsor Essex will compete on the Pentastar Stage in the heritage Capitol Theatre before a live audience. The Grand Prize winner will receive a free booking at the Capitol. WHO CAN AUDITION? Residents of Windsor and Essex County. Individuals and groups are welcome to try out, non-professionals only please – if 51% or more of your income is earned from your talent, you are not eligible to participate. Auditionees under the age of eighteen (18) must show proof of permission from parent or guardian to enter the contest. WHAT IS THE SELECTION PROCESS? All applicants will be invited to a preliminary audition on Monday, April 8th. Based on the application and the performance, the Music Director, together with the Assistant Conductor, will make the selections for the shortlist. In addition to conducting classical music, our conductors Robert and Daniel have extensive experience in theatre, pop music, musical theatre, and dance. The ten finalists will perform in the final competition on one of the two opening concerts of the WSO Pops Series next season, Friday, September 27th (evening concert) and Sunday, September 29th (afternoon concert). For each performance, a panel of judges will select a first, second and third place winner. The Grand Prize winner will be selected from the two first place winners. WHO ARE THE JUDGES? We have invited five people with a blend of skills and knowledge to form the team of judges. W.E. Got Talent Winner Debut Event Package! One FREE Eight hour Booking in the Theatre of your Choice (Maximum Value $1950). Scheduling based on theatre availability. Deadline for Registration: March 31, 2019. Capitol Theatre Windsor will be closed from Saturday December 22 – Sunday January 6. Offices will reopen Monday Jan 7th, 2019. 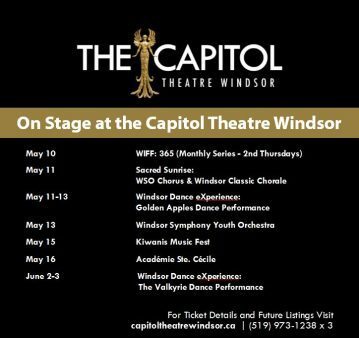 JOB SUMMARY: The Capitol Theatre seeks a Technical Coordinator to assist Capitol Theatre User Groups and Windsor Symphony Orchestra Staff in program service delivery, including audio and lighting. This individual works independently and as part of a team, is competent using Microsoft Office, and working with artists and community groups to produce successful events. Flexible hours are required. This position may be shared by two qualified individuals. In additional to technical skills and knowledge as described above, the successful candidate will possess exceptional organizational skills, the ability to manage multiple event cycles simultaneously, a personable attitude, and the ability to create an environment that is conducive to open and direct communication. Leading candidates will have experience working in a professional theatre and experience with standard theatre lighting, audio, and projector setups, as well as fly operating. TERM OF AGREEMENT: Seasonal contract position January 15, 2019. Full contract will run from August 1 through May 31 annually. Summer work may be available. Compensation: $18 per hour based on an average of 40 hours per week. Note: exact weekly schedule will vary pending Theatre bookings. Evening and weekends required. Monthly schedule jointly determined. 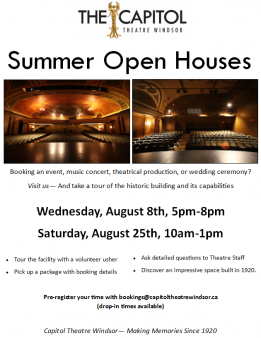 Thank you for your interest in working with the WSO/Capitol Theatre Team. 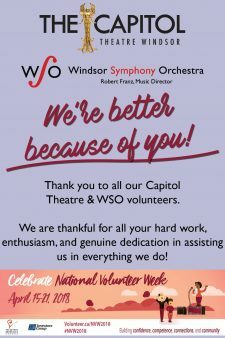 The Windsor Symphony Orchestra (WSO) connects people through music. With its roots in the boom years of the 1940’s to its present incarnation as a dynamic regional professional orchestra, the WSO has spanned three generations. The orchestra’s commitment to excellence and its consistent emphasis on education and community outreach have galvanized a new generation of music lovers in Windsor-Essex and will continue to bring inspired music-making in the future. Throughout its history, the WSO has proudly engaged, entertained, educated, and inspired audiences through the performance of live orchestral music. The foundational underpinnings of the WSO depend on bringing music into a living connection with the greater Windsor community, and finding new and different ways of integrating live performance with other art forms, including film, literature, theatre, and dance. In the heart of Downtown Windsor, the Capitol Theatre (built in 1920) offers the unique convenience of three theatres in one venue. Today, the building is owned by the City of Windsor, managed by its anchor tenant, the Windsor Symphony Orchestra, and available to local artists and community groups as a multi-purpose venue for dance, literature, music, drama, film, and more. Celebrate your choice to LIVE in Windsor, Ontario. Tell us about yourWINDSOR's favourite spots and activities! Thank you to all our volunteers that make the Capitol Theatre possible.